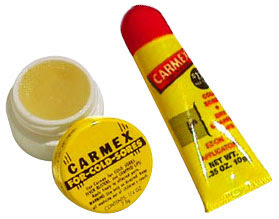 In my lifetime I have tried many brands of lip products, but I have never found anything to compare with Carmex. I love the way it smells, how tingly it is, how lightweight it is, and how healthy it makes my lips look. Plus, it's really cheap. And guys can use it as well. Which reminds me of an incident involving my friend Brandon Bailey... Okay story time. One night Brandon called me raving about this new chapstick he had bought that his sister had recommended to him. Apparently, he said, it makes your lips silky smooth. I asked him what kind it was and he responded that it was Blistex Lip Infusion. This was actually a product that I was familiar with, so I paused before breaking his heart and informing him that Blistex Lip Infusion is really a lip gloss and only to be worn by men who wish they were women. Brandon adamantly disagreed and a few moments later showed up on our doorstep to prove me wrong, his lips gleaming and glistening in the light. After much hysterical laughter and an examination in front of the mirror, he conceded and gave it to me. Shoot we had some good times last year. I miss it! Dani Dani........I am also a fan of Carmex. A really great more feminine alternative is CoverGirl Wetslicks AmazeMint. Its tingly too, because it's actually "infused with Crest Peppermint Oil." It's makes your lips feel like how your mouth feels after you brush your teeth. Plus it comes in a variety of colors! !